On today's episode, Hrishi is speaking with Matt Isherwood, a user experience designer and instructor based in London. 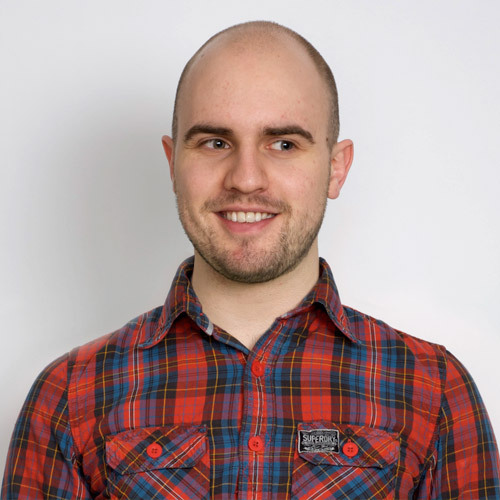 Matt is a UX design consultant specialising in e-commerce, marketplace websites, and mobile apps. He has years of experience in the luxury sector and working on UX strategy with startups. Matt writes a very popular and educational blog on his site, Mattish.com, where he teaches people about optimising user experience through data-driven design. Hrishi Mittal (HM): Hi, Matt. How are you doing? Matt Isherwood (MI): Yeah, good. Thank you. HM: Yeah, thanks for joining me today. I've been reading your blog for a while so I’m really pleased to have you on the show. Would you like to start by introducing yourself to our audience? MI: Yes, sure. It’s good to be here. So I’m Matt. I’m a UX designer, so UX design consultant. I’m also an instructor and writer. I’m doing more sort of writing and things. And I do a lot of work with startups mostly in the e-commerce or marketplace space. Although not only that but that’s kind of where I sort of specialised, and that’s generally companies in London or Europe. So I've been doing this for about the last year or so, been out on my own doing this. Before that I spent about 3 ½ years with a company called Onefinestay. We were kind of a startup when I joined and grew rapidly over the time I was there. Whilst I was there, I was the UX designer on the website and also ended up product managing the website for a few years as well. So that was a really good sort of crash course and learning a lot of how startups work and grow. HM: That sounds great. Yeah, Onefinestay is... Yeah, one of the big success stories from London, isn’t it? HM: So tell me... Let’s go back and tell me a bit about how did you get into design in the first place? MI: I guess it’s really come from since school. I guess I was lucky in that I knew pretty early on what I wanted to do since I found this thing called graphic design. I knew that’s what I wanted to get into. I was always into kind of art and drawing and stuff in school and graphic design seemed like a way you can actually I guess have a career or something in that without the sort of vague riskiness of doing art as a sort of thing. So I really liked the way it kind of merged. So design is a good merging of art and sciences like getting the most of the two. There's kind of rules to fill so you need some inspiration in that. So I ended up doing my degree in graphic design, which I loved, but I wasn’t really doing anything to do web design at that point. I don’t really think I did any web-based projects. HM: Where did you do your degree? HM: Yeah. I know a couple of people who studied design there, actually. MI: Nice! Yeah. Yeah, it was a great place. It was kind of isolated, sort of separate down all the way in Cornwall and really good atmosphere with the students and quite collaborative way of working which I really enjoyed. Anyway, yes, so I didn’t really do much in terms of web design. I came out. It wasn’t until the companies after university where I managed to land a job with the BBC on their actual designee scheme where they kind of taught me UX design from scratch really. It was a great place to go and learn and kind of learn and get experience on the job and be taken to work across different teams from like the journalism team to the audio music team, and eventually spending a couple of years at the World Service. So working on all sorts of different language sites, which was a really interesting challenge. Yeah, it was great. I guess at the time, so that was in like 2008 when I started there, and they had a team of I don't know, 100, 150 UX designers and information architects, something like that. And I think they're probably one of the few people doing UX design that early on. It’s kind of become a lot more popular now. But that time, certainly at that scale I don't think many other people in the U.K.
HM: When was that? Which year? MI: That was 2008 when I started. HM: 2008. Yeah, that’s definitely quite early. MI: Certainly for U.K. I think it probably was existing in the U.S. and certainly in a Silicon Valley kind of way. But it was a really good way of learning about accessibility and importance of designing for everybody. HM: Okay, great. But now your focus is more on data-driven design and business-focused design. When did you decide to move to that area? MI: Well, it’s something that’s kind of evolved over the last year or so. So since becoming a kind of freelance consultant, I've realised I needed to kind of come up with a niche, pick my niche to work in and what I was going to kind of position myself as. I think it’s really important to do that as a freelancer as it’s always going to be harder to get hired if you just sort of pitch yourself as a generic designer, just like I’m a UX designer. Because if I am the client and I have an e-commerce site who am I going to hire? Am I going to hire the guy who calls himself an all-rounder or someone who says they're an eCommerce UX designer or has the specialism? So it’s kind of deciding on how to do that. And then it took a little bit of time to go and work out what it is or how to position myself. My website has gone through quite a few iterations in the last year or so. MI: I've tried things like calling myself remote UX designer, lean UX designer. I think those are really just ways of working and not really a specialism. You need to come up with something… came up with an output that really benefits... benefits the client. I've tried things like calling myself remote UX designer, lean UX designer. I think those are really just ways of working and not really a specialism. You need to come up with. . . an output that really benefits the client. I think they can see the value in being data-driven. They understand they want to do that and they can see the value of having someone who knows e-commerce and understands that. So it took me a lot to get there and it kind of was always there actually, I think, because I've been teaching workshops in those subjects with General Assembly for the last 3 years or so. It’s one of those things that’s staring me in the face, I guess. E-commerce and data-driven UX kind of made a lot of sense but it took me a while to actually just be simple, just push myself a bit. If you want a bit more further reading, I recommended Brennan Dunn of doubleyourfreelancing.com. He writes quite a lot about these things. HM: Yeah. He knows really great stuff. We’ll definitely include this link in the show notes. HM: Did you...? I mean, why did you pick e-commerce specifically? Was that because you worked at Onefinestay or…? MI: Yeah, that’s right. Because I was there, I was working on what we called the e-commerce side at the time. So it was a quite big product at Onefinestay. So for those who don’t know Onefinestay, kind of a high-end Airbnb. Kind of. It’s a bit more complex than that. It’s more of a service side of the design but there were a lot of products that were on the backend dealing with guests during stay but I tended to look after the frontend which is like the eCommerce side, selling the holiday, selling the property that people stay in. So that was where I spent the last 3 years really until it felt natural to follow on from that. I realised that’s kind of what interested me. I've certainly had a growing interest in the sort of psychology of selling online as well and convince people to pay for things and trust you and part with their cash online. HM: Yeah. I find, in a way, actually your positioning quite unique because there are a lot of people who are sort of conversion rate optimisation specialists and who specifically work with eCommerce and things but I haven’t seen many designers who specialise in that. So that seems like a very useful positioning. HM: On your website you mentioned that you have three main areas of focus: data-driven design, e-commerce, and mobile apps. Is that right? HM: So tell me a bit more about how that works and why you focus on that combination of those three things? MI: So the data-driven UX design has kind of come from… so a lot of it came out of this workshop I've been teaching for a while which is called Data Driven UX Design on a Budget. And it’s all the kind of tools I sort of taught myself and ways of working I taught myself as a sole UX designer at a startup who also realised it. As I was kind of transitioning to become a product manager I realized I needed to understand how to use things like Google Analytics and how to incorporate some quantitative data into my process. But also I’m a real advocate of qualitative datum, pairing the two up and doing a lot with those two. And so doing remote testing and other ways you can get both of them working well together. So that’s why I positioned, that’s kind of how I work, I guess, the data driven UX thing, and kind of showing like what… I believe that any designer now has to be able to kind of backup their results with showing that you're improving conversion or you're improving something on the site. That’s kind of how a lot of clients are gradually coming around to understanding that and working that way. I think it’s quite healthy to move away from this idea of, “Oh, we’re just going to do a redesign project that’s going to last.” Just because we’ve got a few months available rather than saying, “Okay, this is what we will improve, this is what we’re going to work towards to get there.” And it might take a couple of weeks, it might take a few months, whatever it takes to get there is more important. So it’s that and then e-commerce is kind of how I position myself as my specialist area, I guess. Thinking about only for e-commerce. And then mobile is just a thing almost as an area that I was kind of lacking I would say a couple of years ago. I've just made a concerted effort to be working more on mobile projects and teaching myself more so I felt right, that’s going to be an area of focus as well. So I've kind of got it down to these three areas of focus. Any more than that I think it would get a bit messy. 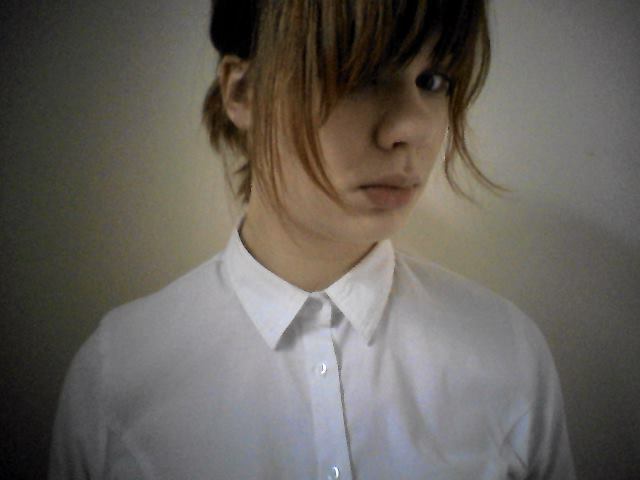 HM: Yeah. Well then it’s not a focus anymore. MI: Yeah, absolutely. It stops being so. HM: And mobile is very, very relevant to e-commerce. The share of sales on mobile is just going crazy. MI: Yeah. I think that mobile is almost like the epitome of the challenge of UX design because they're so little. There's no more kind of half-assing it and messing around with putting loads of things on the screen. You've got so little screen space you've really got to define exactly what your product is and exactly how it works in a really small space. I think that mobile is almost like the epitome of the challenge of UX design because they're so little. There's no more kind of half-assing it and messing around with putting loads of things on the screen. You've got so little screen space you've really got to define exactly what your product is and exactly how it works in a really small space. HM: Yeah. Actually, now that you've touched on it, that is an interesting topic. Can you talk a bit about in your experience what’s the big difference you've seen designing for the desktop web versus designing for mobile apps? MI: Yeah, I guess it’s just that kind of it forces people to make decisions, like clients and teams that you work with to make decisions a lot more about what is important and what is it you're trying to do. Because you realise that people are probably going to spend less time doing this task. On mobile, you're so broken up by distractions in what you're doing. You've got to be aware of the reality of what you're designing for is a platform where people are constantly being invaded by notifications while they've got the real world going on around them. So you've really got to focus a lot more and try and understand what’s the most important thing. Whereas on the web I guess you can be a bit slower and you realise that potentially people are going to take several trips to your website before converting, whereas the mobile side is much more functional, and I want to do a job now. I want to do task-based. So it’s a little more task oriented. MI: Roughly, that’s kind of what… I mean, it’s not necessarily that simple every time but that’s kind of how I look at it. HM: Yeah, okay. That’s a good way of looking at it. Can you give us some examples of interesting projects, mobile or even desktop web, that you've worked on recently with clients? MI: Sure. I'll give you a couple of examples. So one, a web-based one that I've been working on is with a company called Incrediblue. That’s like incredible but blue instead. Incrediblue.com, they're actually a Greek company. I've been working remotely with them for the last year or so and I've done a few iterations and versions of their website. Basically it’s a site that allows you to book yacht holidays or sailing holidays for people who basically… really aimed at people who’ve never been on a sailing holiday before. They sort it out with the captain and a boat and they sort out the itinerary. It’s actually relatively affordable. A lot of people talking price start thinking it’s a really scary, expensive holiday. Actually it works out, you can go on a decent week’s long holiday for about €500 per person. But what I really enjoy about that, that was a great product of trying to… A lot of that was about distilling it down. They started off almost like an Airbnb for yachts before realising that most people if they're a beginner user, you have someone who don’t actually know what yacht they want to take. They want to be told what they need to do and need to be handheld a lot more through the process. It’s a lot more about refining that and understanding how safe was their journey. And also just the images are great on that site. They have a great visual design and great look and it was already into hundred site to user test because every time users were just being blown away by how great the images were and really enjoying just the experiencing themselves in the site, which is an easy thing that’s overlooked I think, and just realise how much work great imagery can do. HM: Yeah, it's very meta. MI: Basically they allow people who want to be Uber drivers but don’t own a car to be able to rent one by the shift or by the week. So it’s great for this kind of people who are in this big economy. It’s actually one of the hardest things to get a hold of is the car and that to me the biggest outline-based expense is opening up to a wide audience. People who can now become drivers. And they've partnered with Uber. That’s been really interesting because we’ve been doing bits of stuff on the website but a lot I've been working on that app which is upcoming, of their mobile design. Well, it’s not out yet but it’s going to be interesting because it’s a process where we have a bit more control over the user’s experience all the way from booking a car to drive all the way through… In the future, we’re going to be developing features around what they do when they come to make the booking, when they come to start the booking, when they're driving, when they come to drop the car off. You've got that whole kind of customer life cycle there which is really interesting. And also what’s kind of cool is their office. It’s up in Dovaston and they have an old shop as their office. So they're almost onto the street front and there's drivers dropping in all the time so you're really close to your users. We needed to do a quick kind of user testing and grab them to one side and test our prototypes with them. So it’s really nice to feel the sort of, understand pretty quickly what the pains are of the users and see how you can change how they enjoy that side of things. HM: Yeah. That sounds a very unique, interesting project. You mentioned user testing. Can you talk a little bit about how you go about it and can you recommend maybe some tools for our listeners that they could use? MI: Yeah. Sure. I’m a big fan of remote user-testing. Actually I've done a lot of that over the last few years which basically means when the user isn’t present, when you don’t actually have to be sat down with them in a lab or in a room, they can be at their computer or at their mobile, wherever they are normally and doing the test as they would do. I think it’s really impressive to realise actually you don’t need a moderator very often. People are actually pretty good. You can get a lot of great data just watching people use the site on their own. And it’s much more realistic. You're much more likely to see them doing things as they would do them for real and you'd hear real, unvarnished feedback. They're not worried about offending you or being polite. They're just if it doesn’t work they're going to say it doesn’t work. And the tool I use mainly for that is UserTesting.com. I’m a big fan of UserTesting.com. You can set up a test in the morning and by the afternoon you can have back all your test results. They all come back in as videos of users either scrolling around your website or you can do mobile apps as well. And you get a video with them speaking so you can hear their thoughts when they're moving around the product. And then you can make clips from that video really quickly and easily, put those clips into highlight reels. Just great for sharing with clients. So it’s great for working when you're working remotely with clients sharing that sort of content around is really easily. And also even if you're working with kind of bigger companies where there's management involved and they want to see user testing but they have no time, you can put together a quick highlights reel of your user testing and just send it to them and say, “Look, if you've got 10 minutes watch this. These are the key things you need to know about how your site’s got problems or where you need to improve.” And it does cost a little bit of money to use UserTesting.com. It was at about $50 per test, which is actually pretty reasonable, I'd say. But if you want to give it a dabble beforehand, you go to peek.usertesting.com. You can try out up to three free tests on there, free 5-minute long test. MI: So that’s a quick way if you want to just practice on how to go and see how their system probably works. That’s peek.usertesting.com. HM: Yeah, that sounds great. We’ll add that link to the show notes. Can you give us an example of an interesting user test you ran recently? Maybe something that surprised you? MI: Wow, ok. I think there's so many things I guess that you find that you wouldn’t expect to understand, you wouldn’t necessarily expect until you see someone. I think one of the things on one of the sites I did, I won’t say which one, but they had kind of a help area. It suddenly was really easy to be able to get into the help area which is almost like a separate site. And once in there, the user will get trapped. It was something really basic like in the top left there wasn’t a link back to the homepage. So they’ll be getting totally trapped in the help area which is full of FAQs and questions in this mini-site. They can never get back out to the main site and you would see them trying to complete the task within there. And it would’ve been so easily avoided had people just got a link back to the main site. That was a really quick, easy fix. Often it’s some really simple things that you can just change really quickly. And you would see people who would actually get totally trapped in a different part of the site they don’t mean to be. And really simple things as well often. It’s a thing that some sites do, some sites don’t. You know when if you’d say Click a Link a lot of the times on hotel booking sites, they might open that page in a new tab. And I’m always still amazed to see how many people… not amazed but it’s kind of surprising, I guess, to see how many people still don’t understand that pattern. They don’t realize it’s opened a new tab. Often so many users rely on the back button of their browser and they kind of get trapped because it breaks the back button. They try to get back and they can’t work out why. It’s never been clear they're opening a new tab. They don’t realise the site’s still at another tab and they kind of again get trapped. So those kind of really painful moments when you start to think, oh, this is so easily avoidable. But it’s really useful for some to motivate and change that can be done quite quickly. HM: Right. Well, I’m going to go and check all the new tab links on my website. I've never thought about that. You know, the other one you mentioned about getting trapped in a different sub-domain, like a help site or something, that’s one of my pet peeves with a lot of startup blogs. They'll have their blog on a blog.whatever startup.com domain and 90% of them never link back to the main site. And it’s fine if you're a techie and you'll type in the URL or you'll Google the site or something but most people don’t do this. MI: Yeah. Most people won’t go near the URL bar. They won’t remember what they're doing on there and they won’t feel confident doing that. So I know exactly… it’s crazy especially when it’s in a blog where you're trying to do words and probably promote your company or promote your startup. HM: Yeah. That’s the whole point. MI: When someone likes your page and they want to find out more about the company, don’t make it hard for them. You've got to think about that journey, otherwise you're just writing content that’s going to be lost to the world and it’s not giving you any benefit. When someone likes your page and they want to find out more about the company, don’t make it hard for them. You've got to think about that journey otherwise you're just writing content that’s going to be lost to the world and it’s not giving you any benefit. HM: Yeah. Actually that brings me to your blog, so talking about user testing specifically. Because you write a very educational blog teaching people lots of useful practical design things. I was reading your blog and you wrote a really interesting and maybe controversial post recently about A/B testing. Do you want to tell us about that? MI: Yeah. Basically, I wrote a piece saying if you're a small or medium-sized company you just shouldn’t bother with A/B testing. And it was kind of in a way sort of redress the balance against all the kind of the lean startup kind of thing where they just talk about A/B testing everything. “Just put an A/B test on this one, an A/B test.” One of these things actually came from the workshop I taught on data-driven UX design and I used to teach A/B testing as a part of that. But the more I taught it and the more I learned about it and the more I did A/B testing, the more I realised how many kind of caveats there are and you sort of say, yeah, you come and A/B test but you need to be careful using this or this. Then you need to be careful, you need to make sure you get the right amount of traffic to make sure you're running a really fair test. You need to make sure everything is going to equally serve in balance. And the more I was talking about it, the more I got uneasy just telling people they should do it and I realised that actually maybe a lot of people just shouldn’t do it. It’s kind of a case of a little knowledge can be a dangerous thing. When people maybe just know how to set up an A/B test they could be running a really bad A/B test. And that’s what I was doing initially actually when I first started using it. I was running a lot of bad A/B tests. We weren’t getting to a significant number of people through the tests so we couldn’t really say for sure of these results but we were sort of shouting about how good the results were. And so I just think it’s one of those things that people need to be really careful of. It’s easy to just kind of set up an A/B test quickly and say, “Oh, we’ve got a winner,” and then think you've done your work whereas it’s really heavy statistics involved in A/B testing. There's a lot to understand. I think unless you're a data scientist or unless you've got that kind of setup which is a really robust A/B testing setup, it can be more dangerous than not doing it. I think actually for a lot of small companies or startups where you don’t have that kind of traffic, much better off doing a user testing program. Set up a program of user testing to regularly user test. You're going to get way richer data, way more understanding of what works, what doesn’t. Just by watching users move around your site, you'll see what works and what doesn’t. You don’t need to run an A/B test for months or so to get the traffic. You need to understand whether something’s better than something else. I'd say for a lot of companies they should be looking at user testing rather than this kind of A/B testing. And I understand why A/B testing has become sort of popular because it gives just such great headlines. It gives so many great blog posts so they can say, “Oh, we increased conversion for 30% on this.” And then I’m always left thinking did you though? Really? What are your numbers? Can you publish your numbers? Let’s have a look at were they really significant, were they meaningful or did you just run it like 100 people or something? HM: Like you said, it’s a very complex statistics topic really. But I would’ve thought that tools like Optimizely, your original website optimizer, they would take care of that science or the tech part of it? MI: To a degree, and they're increasingly getting better. But I still that a lot of them, they'll tell you if your results are significant but they won’t tell you if you've really had enough results necessarily, enough users go through it. So statistical significance is one part of the equation. But you can get significant with very few people going through your test. That’s just telling you a measure of difference between the results. Really in most cases you need a lot more people to go through to be able to be sure that these results are meaningful, they're going to stand up to bigger amounts of traffic. HM: Yeah, sure. Talking about this sort of takes me back when I used to work in air pollution research. We were looking at all sorts of sources of pollution and trying to relate them to health effects. There's just in technical parlance you call it confounding factors. It’s just so complicated to tear apart exactly what caused what. I guess, yeah, like you said, it makes for good headlines but it’s hard to do. Do you have a number in mind as to at what scale it makes sense to do A/B test? MI: I guess if you have the kind of traffic, if you're looking in the hundreds of thousands of users a month coming through your site then you could probably start looking at A/B testing. So it’s like unique users. If you're getting 100,000 plus then you're probably going to be able to run some tests in a reasonably good amount of time. HI: So talking about your blog a bit more, how do you decide what to write about? MI: Yeah, I guess that’s always come to feel like a bit of a challenge but I think one of the things that really helped me was last year when I started… so I've had a blog for a few years and it’s kind of those things that you maybe write and ask for every month or two and think and really struggle thinking what should I write that’s important. But last year, I made myself write an article a week. I think that was really useful just kind of forcing yourself to find something and find something interesting. I really didn’t put a limit on what I'd write about. I wrote a really diverse set of things, some stuff about practical UX design also the odd opinion pieces around what Twitter is doing and how Facebook is working and things like that before realising that actually that’s not what I should be writing about because no one normally cares what I have to think about that. If I was like a VC in Silicon Valley then maybe. Then you realise actually here’s my specialism, what I’m expert. And I've been an instructor in UX design for a number of years so I've got these sort of practical skills and thought that’s the kind of stuff that will be useful. That’s the kind of stuff people like. And it’s kind of more evergreen concept as well. I think if you're teaching something or giving tips and ideas that’s always something people will come back to and doesn’t dent so much. So I've already got this kind of specialism so it’s actually kind of… and some of the ideas come from questions that people ask when I do teach. You think something I haven’t covered before that could spin off into its own blog. Or even just sometimes I kind of take a slide from one of my talks and realise actually I can really expand on this and say a lot more about it. You kind of gloss over and sort of posit when you're just talking about it in the context of a bigger subject and you realize there's a lot more that could be said here. So I think it’s kind of realising there's no niche too small that it can’t be turned into something more to be said. In many ways, a good blog or article was actually just taking something very narrow and just focusing on that rather than trying to be everything. HM: So how often do you write now on your blog? MI: Now I do it fortnightly. Last year I was doing it weekly which is a really good way of getting myself into it, but then I realised once I sort of found my voice and found what I’m going to write about, I realised fortnightly is probably a better way to work. And focus on making the post a bit more quality and a bit more kind of considered. That seems like a nice amount and people seem to be happy with that. HM: All right. I subscribe to your newsletter where I get different vocations and I love it. I definitely learn something new every time I read something. So how do you recommend people learn user experience design? Like if someone’s starting out or someone is maybe even already a designer and they want to get more into user experience? MI: Yeah. Well, I think it’s definitely a practical skill or practical area. You really need to learn by doing and it’s something you can’t really learn on your own and you don’t learn so much. You kind of need to get out there and meet with a few people and do a bit of your research side of things and do some testing and dabble in all these kind of things. When I taught the full UX design course in the past at General Assembly, I could tell pretty early on who’s going to make as a good designer. Because for instance, half of that course is all research. We don’t actually sit down and do wireframe or anything. It’s on the second half. So there's some people who come along just expecting it to just be learning some more software skills and others who come along thinking, oh, we’re just going to… I thought I'd just sit here and listen to all the lessons. I'll understand everything. I don’t think you can really learn until you actually do and actually understand the difficulties of it and try stuff out and work out what’s going to be experimented. There's going to be things going wrong. So just a very practical subject area. I think your best way is either I can recommend the General Assembly course. I think that’s a well put-together course. And also what’s really good about it is that the people teaching it are real practitioners who work in the area of UX design and teaching assistants as well. They're UX designers and still getting genuine advice, you know? But if you're not in a city where General Assembly are then maybe if you've got an employer who’s willing to kind of let you move into UX design and try and sort of do that, then it’s kind of really about having someone spoiling you and saying how you're free to try this out and do it and meet with users and test stuff out and put prototypes together, put it in front of people. I think that’s really the way you learn so much quicker that way. Of course there's loads of articles out there you can read. Of course there's plenty of sites you can pick things up, but you'll exponentially improve yourself by just sort of doing and practicing. HM: Great. That sounds how I really go about it. We have a few courses coming up on design and UX design as well, but we’re going to try and make them very project-based so people are actually doing things as they're learning like you recommend. MI: Yeah. I think having a project that you care about and you can see the full life cycle is really important rather than just learning the skills in isolation. HM: Yeah. Talking about learning, you have written a book on data-driven UX design. HM: Can you tell us a little bit about that? MI: Yeah. 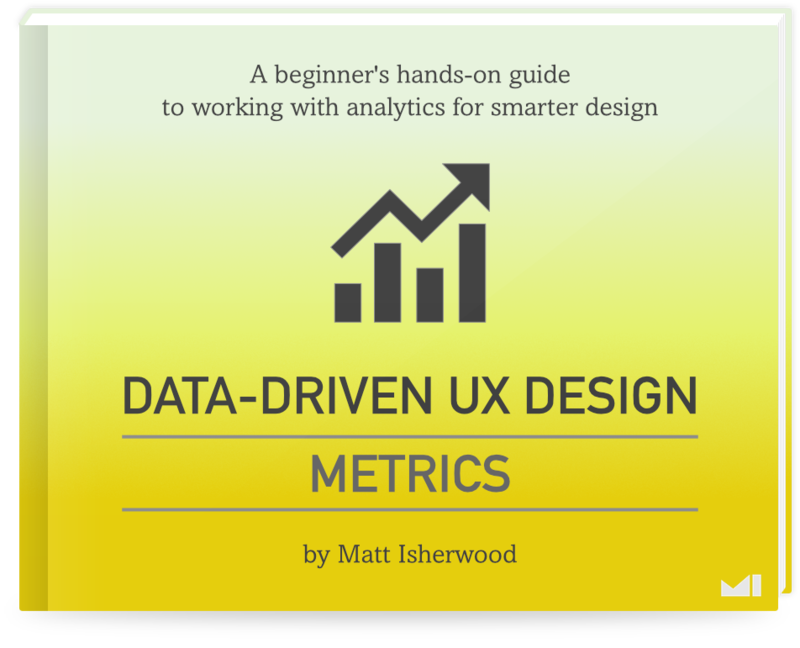 So it’s called Data-Driven UX Design: Metrics. Again, it’s one of those things that spun out of the workshop I've been teaching for a few years on data driven UX design. This kind of covers the more quantitative side of things. So really it’s kind of a guide for designers, UX designers for how to get the most out of Google Analytics and tools like that and help with things that I think a lot of designers are kind of aware of and they think that would be a useful thing to have as part of their armoire but are a bit scared of because maybe they're not naturally inclined towards the numbers side of things. I guess I wrote it because I've wanted to write a book. It’s one of those things I've wanted to do for a while and I really like the idea of having my own product that I could kind of sell on my site. The dream of having passive income and you can put something in the site and just get people just buying it in the background. You don’t have to do any work. But there's a lot of work upfront. It took me over a year to end up putting this book by me together. And I went through a long process of it initially really bloated and then I realised I had to refine it down. So that’s where I just decided to take the quantitive side of things and just focus on that. But I was actually really inspired by the work of Nathan Barry. He's written quite a lot about this and he wrote a book called Authority which I recommend if anyone’s interested in writing their own. It talks about how you can write something and then eventually set up and sell it. But the whole process is really just an experiment. I had no great expectations how many I was going to sell to, how many I was going to… I had no great aims. I just wanted to get it out there, have a practice at writing, designing, marketing it and just see how it goes. I feel it was all kind of a test for doing more in the future. My aim is to do a few more in the future and I've actually got another one in the pipeline maybe coming out soon. HM: Oh, great. What’s that one about? MI: So that one is going to be on mobile side of things. That one’s going to be about iPhone app usability. So this one’s actually based on a series of blog posts I wrote over the last year. So it’s a different approach. I’m taking concepts I've already written and then completely updating it and refreshing it, putting it all together into a book around and all the things you need to think about to make iPhone apps usable when designing them. So again, it’s a bit of an experiment. I’m trying to turn it around on a lot quicker timeline as well so it should be out in May this year. It’s like a practical book around showing lots of examples of how you can make a great really usable iPhone app so users are satisfied and want to come back for more. Again, it’s kind of a little niche size but I don’t think we’ll announce as really kind of doing this. But, yeah, I've really enjoyed the whole book process and it’s something that kind of does give rewards later on. Now I sell a few books a week and it’s already a nice feeling to get that kind of little notification pop up in your phone saying someone’s interested in what you've written. HM: Yeah, absolutely. It’s a very satisfying experience. I wrote a book years ago now on data visualisation and it’s nice to still get the odd email saying that it helped someone learn something. HM: It’s great. We look forward to your new book as well. It sounds very useful. I wanted to take a minute to ask you specifically about your thoughts on online education because here at Learnetto we are running an online education site where we have various courses on all sorts of tech skills specifically related to making and designing and selling products. So I wanted to find out what you think about online education and where you think it’s going? MI: It’s not something I've got a huge amount of experience in yet but it’s definitely something I’m interested in. I’m really interested in the possibilities of doing things online and I just think it offers that potential to really open up. I mean, already through the medium of blogs and books you're kind of opening up that kind of knowledge to a wider and wider audience. And then with the idea of a course I like the idea of taking users or students, in this case taking students through a journey and being able to kind of handhold them through a journey, give them feedback, get them to actually learn a skill without necessarily ever having to meet them. You can reach a wider audience. But I think it’s just going to be something that’s only going to grow and we’re going to see more of them. Actually education itself, I've been for various articles I've read in recent years talking about how education could really flip on its head and actually almost all education could be taught online in the next 10-20 years. And it’s actually that in-person stuff that you're paid for where schools could go down that kind of route to be about. You're not paying for the in-person time. You do almost everything else is democratising, almost freely available online. HM: Yeah, absolutely. I think Khan Academy kind of pioneered that concept of turning the classroom upside down. Yeah, that’s really interesting to hear your thoughts. That’s all the formal questions that I have for you today. Just one final thing. Where can people find you online to follow your work and you? MI: Yeah. You can come and find me at Mattish.com. That’s my website where I've got loads of articles now on there on the three subject areas we were talking about. And you've got those places you can sign up for my newsletter but if you're interested in that directly, that’s mattish.com/newsletter, and I'll get you a mailing list where you get every two weeks my latest article and you'll get discounts for my new book and things like that. Also, I’m @ishmatt on Twitter so that’s the reverse of my name. HM: Okay. Great. Thank you. We’ll add links to all of those things in the show notes. Thank you very much for being on the show. It’s been really interesting talking to you. MI: Yeah, no problem. It’s been great to be on here. I very much enjoyed it. HM: Sure. Thanks very much. Have a good day, Matt.